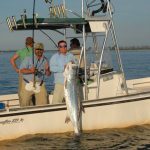 Tarpon fishing charters, what kind of person would enjoy a trip after the silver king? Tarpon are the ultimate game fish. They are the only fish in the world except for maybe a large marlin that have all the attributes of battle that leaves even the most season angler with some of their most memorial moments of one’s life. Tarpon have stamina a lot of stamina, maybe because they have two lungs one that breaths raw air and one that filters air out of the water. 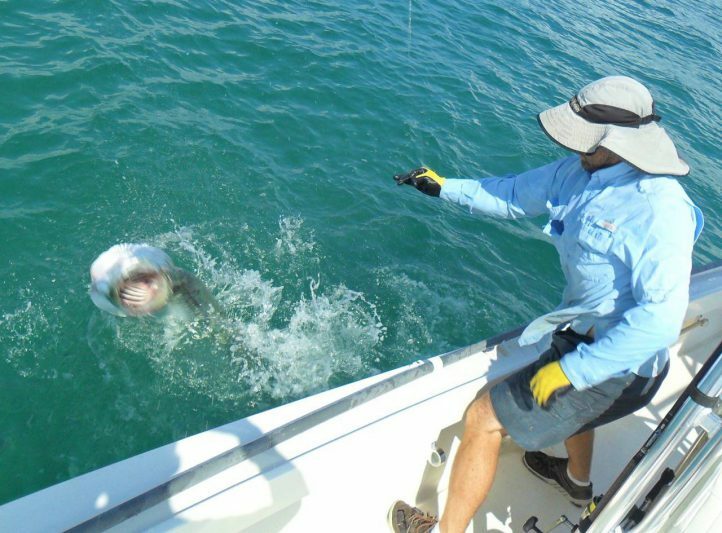 A 200-pound tarpon can fight for 2 hours or more on 65lb line with the drag locked down. Just when you think a tarpon is about to give up they take off for another run an hour or maybe even two hours into a fight. Tarpon jump high sometime 15 feet out of the water flipping, cartwheeling and spinning at the apex of their leap. Strength and power, Tarpon are unbelievably strong, they snap 100lb leaders with ease, break rods, bend and snap hooks regularly, they burn the drags and gears out of reels all the time. When you first hook into a tarpon even a small 70 or 80 pounder there is no turning the fish they go where they want too even on 65lb test spinning tackle. 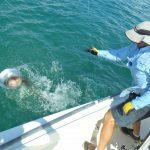 When you hook a 150-pound tarpon or larger you better dig in your heals because there is hell to pay if you plan on bring them to the boat side. 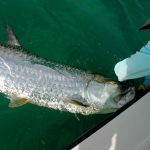 Tarpon fishing may not be for everyone, but in my experience most everyone I ever met enjoys it and by the end of a day of tarpon fishing I really believe it becomes one of the most unforgettable memories of most people’s lives. Off course seasoned expert anglers love them for the thrill of the hunt and the explosive battle. Beginner and novice anglers love it just as much it’s a thrill they never forget and a story they can tell around the office, to family and friends for year to come. After landing a tarpon you get that feeling of accomplishment that you just can’t get from almost any other fish. Kids enjoy the moment to. I have had boys as young as 12 battle and land tarpon by themselves, but even the younger children too small to hold on to the large pole love to cheer for their older sibling and parents as they get tugged around the boat by a large tarpon. Imagine the lasting memories a 6 or 7-year-old has of watching a monster tarpon when it is hosted up for a quick photo. 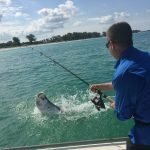 Many people come from all around the world to fish for tarpon on Anna Maria Island so when they land there first tarpon it can be the pinnacle of their angling career. Most vacationers that come to the island for sun and relaxation that end up booking a tarpon fishing charter say it becomes the high light of their family vacation. Tarpon fishing charters are for anyone and everyone the experts, beginners, the young and the old. It can become an individual achievement landing one alone or a team effort letting each person aboard the boat take turns fighting the fish. It’s a one of a kind experience that leaves lasting memories for a lifetime. My grandfather was over 80 years old when he solo battled is last giant trophy size tarpon. I’m so glad we had that experience together he told the story till he was 94.